The countryside is very different over the border and into Scotland. The lushness of English vegetation is gradually replaced by hardy greenery that can withstand Scottish winters. Hillsides are clothed in woodland and beds of heather stretch across moorland. 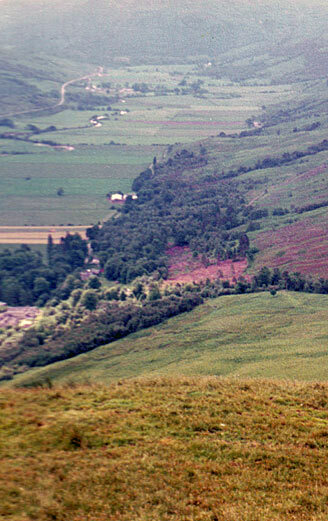 Farms tend to lie in the sheltered valleys. Visitors will see that there are dairy farms and arable farms all over Scotland. There are also quite a few fish farms which could be good places for a holiday if you like to include and spot of fishing during your holiday. Small farms in Scotland are called crofts and these are most lilkely to be able to offer their guests real involvement in the work of the farm. You might be able to try your hand at milking a cow or a goat. Scotland has its own breed of cow. The shaggy Highland cow is quite an attraction in itself. A farm holiday in the Higlands may be just the place to spot deer and wildlife. Scotland is rich in wildlife and it is incredible what you can spot, especially at dusk or night. Rabbits are everywhere, pheasants commonplace in rural areas. Listen to owls hooting at night and spot golden eagles soaring in the skies searching for prey. The best time to visit Scotland for a farm holiday is from May to September. Click on the following link to view more about farm holidays in Scotland.